Background: The relationship between dyslipidemia and type 2 diabetes mellitus (T2DM) has been frequently reported. Lipoprotein lipase (LPL) is considered to be an effective gene in regulating lipid profile. MicroRNAs (miRNAs) are small noncoding RNAs involved in posttranscriptional regulation of gene expression. In the present study, we have evaluated rs13702 (C/T) polymorphism located in miRNA-410 binding site of LPL gene in subset of Iranian T2DM patients and their normal counterparts. Materials and Methods: In this case–control study, 102 T2DM patients and 98 healthy controls were worked out for rs13702 single nucleotide polymorphism genotypes. High resolution meting (HRM) analysis was used for genotyping. Results: C allele of rs13702 C/T polymorphism located in miRNA-410 binding site in LPL gene was detected to be significantly associated with T2DM (C allele; odds ratios (OR) = 1.729 (95% confidential intervals (CI) = 1.184–2.523); P = 0.005) also its CC genotype (OR = 3.28 (95% CI 8.68–1.24); P = 0.010) showed the same association. Conclusion: Correlation of rs13702 C allele with susceptibility to T2DM may be due to the higher level of LPL that leads to increased plasma fatty acids and its entry into peripheral tissues such as skeletal muscle, liver, and adipocytes causing development of insulin resistance and ultimately T2DM. The lipoprotein lipase (LPL) gene is located at 8p22 and known as an important regulator of fat storage in the body. This function is accomplished by the removal of triglycerides (TGs) from the blood stream and transfers them into the fat cells. The main factor in development of hypertriglyceridemia is impaired clearance, presumably because of LPL dysfunction. Impaired LPL system is associated with insulin resistance and T2DM. LPL also binds to chylomicron residues which facilitate their transfer to the liver where removal of the lipoproteins by low-density lipoprotein (LDL) receptors are undertaking. Reports on LPL polymorphisms and their association with lipid profile in different populations revealed significant differences based on their ethnic and geographical origins., However, studies on association of genetic polymorphisms of LPL and T2DM are very limited. Evaluation of the rs13702 (C/T) polymorphism, a SNP located in the 3′ UTR of LPL gene with no record of previous studies in Iranian population has undertaken in this study. We also examined other anthropometric characteristics of cases and controls in relation to T2DM and individuals' rs13702 genotypes. 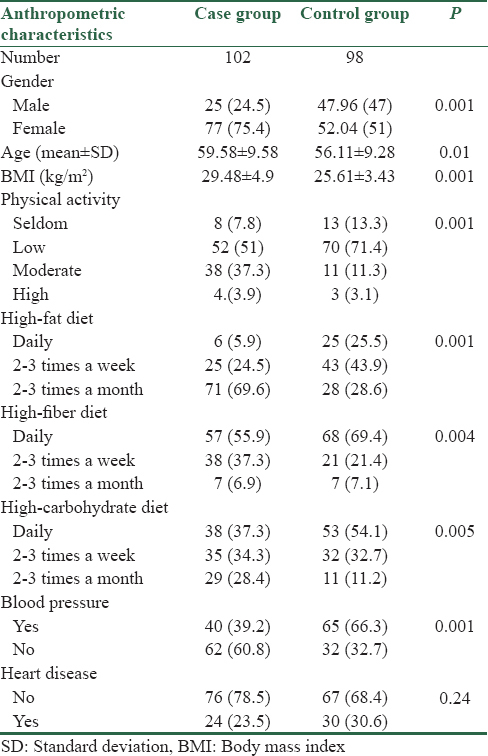 This case-control study conducted on 102 T2DM patients (25 men and 77 women; age 59.58 ± 9.58 years; fasting plasma glucose 151.44 ± 62.07 mg/dL; body mass index (BMI) 29.48 ± 4.9 kg/m 2); [Table 1] and 98 healthy participants (47 men and 51 women; age 56.11 ± 9.28 years; fasting plasma glucose 90.40 ± 6.17 mg/dL; BMI 25.61 ± 3.43 kg/m 2); [Table 1]. Cases and controls were randomly selected from the Isfahan endocrine and metabolism research center. T2DM patients were selected on the basis of the world health organization (WHO) criteria (fasting plasma glucose >126 mg/dL, and/or 2 h oral glucose tolerance test >200 mg/dL and essentially all were on drug therapy for T2DM). Again according to the WHO criteria control individuals were selected on the basis of items like: no history of T2DM in the first degree relatives and fasting blood glucose <110 mg/dl. However, we precociously selected those with fasting blood sugar of <100 mg/dl (90.40 ± 6.17 mg/dl). Informed consent was obtained from all participants in accordance with the Isfahan University of Medical Sciences Ethics Committee. DNA was extracted from 0.5 ml EDTA anticoagulated peripheral blood using GenetBio kit (Korea). The quality and quantity of the extracted DNA was determined by using agarose gel electrophoresis and spectrophotometry at wavelengths of 260 and 280 nm. Genotype analysis of rs13072 was performed by real-time polymerase chain reaction high resolution melting method (HRM) using QuantiFast SYBR®Green kits (Qiagen, Germany) and Rotor-Gene 6000 analyzer device. The thermal profile of the reaction applied was as follow: preincubation at 95°C for 15 min, 40 cycles of 95°C for 15 s, 60°C and 72°C both for 20 s, finally for HRM analysis, the temperature profile was increased from 75°C to 90°C at the rate of 0.2°C/s. Melting curves were normalized between the two temperature ranges compared with samples of defined genotypes as standard. To determine sample genotypes to use them in HRM analysis as standard genotypes, some samples were subjected to genotype assessment by direct sequencing. For statistical analysis, SPSS windows software (version 20.0; SPSS, Chicago, IL, USA) was used. Hardy–Weinberg equilibrium assumption was performed to compare the observed and expected genotype frequencies using χ2 test. Logistic regression analysis was accomplished to investigate association between genotypes and T2DM and calculate specific odds ratios (ORs), 95% confidential intervals (CIs), and P values. Mean age of cases and controls, cholesterol, triglyceride, and fasting plasma glucose were compared using t-test. Alleles and genotypes comparison was performed using χ2 test. Aadjustments made for gender, age, and BMI as covariates between the study participants. Anthropometric data of the participants, including age, gender, BMI, physical activity, blood pressure, heart disease, and diet are summarized in [Table 1]. No deviation from Hardy–Weinberg equilibrium was detected among the cases or controls. A statistically significant difference was observed for the physical activity (P = 0.001), blood pressure (P = 0.001), diet; high-fat diet (P = 0.001), high-carbohydrate diet (P = 0.005), and high-fiber diet (P = 0.004) variables, between the controls and case group. The frequencies of the CC, CT, and TT genotypes in the case group were 17.6%, 24.5%, and 56.9%, respectively, and the genotype frequencies in the control group was 6.1%, 24.5%, and 68.4%, respectively. The distribution of rs13702 C/T polymorphism genotypes significantly differed between the controls and case group (CC vs. TT + CT) [Table 2]. The CC genotypes of rs13702 C/T polymorphism within the LPL gene compared to TT + CT genotypes indicate an association between rs13702 and T2DM among our study population (CC genotype OR [95% CI] = 3.28 P = 0.010). Furthermore, we studied the allelic frequency distribution of rs13702 C/T polymorphism among the cases and controls. The study results showed that the C allele of the rs13702 is more frequent in the case group than control group (30.2% vs. 18.6%) and also we found that C allele of the rs13702 C/T polymorphism had a potential association with an increased risk of T2DM (C allele; OR = 1.729, 95% CI = 1.184–2.523, P = 0.005). Genotypic and allelic frequency of case and control group had no significant association with lipid profile (TGs, cholesterol, high-density lipoprotein (HDL), and LDL of patients in our population. In the present study, association between rs13702 C/T polymorphism located in 3' UTR reign of LPL gene and T2DM was investigated in a subset of Iranian population from Isfahan province located at central part of the country. CC genotype of this SNP showed significant association with the risk of T2DM in our study population. Moreover, it was understood that the CT genotype was expressively associated with protection against T2DM development. Furthermore in this study, no significant relationship was detected between participants' lipid profile and rs13702 C/T genotypes. LPL is a protein with multiple functions that are produced and secreted by parenchymal cells such as brain, heart, fat tissues, skeletal muscles, as well as blood macrophages. LPL hydrolyzes circulating core TGs of very low-density lipoprotein and chylomicron, in fact LPL plays a key role in metabolism and transportation of blood lipids. It also creates free fatty acids (FFA) for storage in adipose tissue, oxidation, and utilization in the heart and other tissues. The rs13702 C/T polymorphism is located in the miR-410 target site. The existence of allele C in this position destroys the binding site of miR-410. This destruction leads to increased expression of LPL. LPL overexpression leads to increased fat metabolites, consequently FFA accumulated in several tissues like liver and muscles. Given that these tissues are major responsive organs to insulin, the accumulation of fat metabolites can lead to insulin resistance in liver and muscles. Insulin resistance is considered as one of the major causes of developing Type 2 diabetes and its side effects. However, increased expression of LPL in adipose tissue will improve glucose metabolism and insulin tolerance. On the other hand some evidence represent that in people with T2DM, LPL activity decreases, which ultimately leads to increased TGs and decreased levels of blood HDL. An experimental study in 2008 was indicated no significant relationship exists between rs13702 C/T polymorphism and diabetes. Nevertheless, Rendel et al. postulated a hypothesis for FFA and glucose uptake by tissues as early as 1963. They stated FFA can inhibit glucose uptake by insulin stimulated cells through increasing the oxidation of fatty acids and reducing carbohydrate oxidation in myocardium and rat diaphragm. Endoplasmic reticulum stress: Studies on the side-effects of the increase FFA in plasma indicate that the increase in FFA can induce endoplasmic reticulum (ER) stress in adipocytes, liver cells  and pancreatic beta cells. Studies have shown that ER stress activates c-Jun N-terminal kinase (JNK) pathway and subsequently causes insulin resistance. Overall, rs13702 C allele destructs the binding site of miR-410 and leads to overexpression of LPL which ultimately lead to n resistance in target tissues. However, this study determined no relationship between genotype and lipid profile, but it should be noted that lipid metabolism is very complex and affected by numerous regulatory genes. In fact, rs13702 C allele causes overexpression of LPL and slowly reduces serum triglyceride level and moves FFA to peripheral tissues. High level of FFA in peripheral tissues such as skeletal muscles and liver can lead to insulin resistance through mechanisms described above. These mechanisms can be considered as a beginning point of T2DM development and its subsequent complications. We would like to appreciate generous cooperation of Isfahan endocrine and metabolism research center, Isfahan University of Medical Sciences, Isfahan Iran. Cai Y, Yu X, Hu S, Yu J. A brief review on the mechanisms of miRNA regulation. Genomics Proteomics Bioinformatics 2009;7:147-54. Kong L, Zhu J, Han W, Jiang X, Xu M, Zhao Y, et al. Significance of serum microRNAs in pre-diabetes and newly diagnosed type 2 diabetes: A clinical study. Acta Diabetol 2011;48:61-9. Gong W, Xiao D, Ming G, Yin J, Zhou H, Liu Z, et al. Type 2 diabetes mellitus-related genetic polymorphisms in microRNAs and microRNA target sites. J Diabetes 2014;6:279-89. Elek Z, Németh N, Nagy G, Németh H, Somogyi A, Hosszufalusi N, et al. Micro-RNA binding site polymorphisms in the WFS1 gene are risk factors of diabetes mellitus. PLoS One 2015;10:e0139519. Zhao X, Ye Q, Xu K, Cheng J, Gao Y, Li Q, et al. Single-nucleotide polymorphisms inside microRNA target sites influence the susceptibility to type 2 diabetes. J Hum Genet 2013;58:135-41. Olivecrona G. Role of lipoprotein lipase in lipid metabolism. Curr Opin Lipidol 2016;27:233-41. Rodrigues R, Artieda M, Tejedor D, Martínez A, Konstantinova P, Petry H, et al. Pathogenic classification of LPL gene variants reported to be associated with LPL deficiency. J Clin Lipidol 2016;10:394-409. Daoud MS, Ataya FS, Fouad D, Alhazzani A, Shehata AI, Al-Jafari AA, et al. Associations of three lipoprotein lipase gene polymorphisms, lipid profiles and coronary artery disease. Biomed Rep 2013;1:573-82. Liu G, Xu JN, Liu D, Ding Q, Liu MN, Chen R, et al. Regulation of plasma lipid homeostasis by hepatic lipoprotein lipase in adult mice. J Lipid Res 2016;57:1155-61. Hassing HC, Surendran RP, Mooij HL, Stroes ES, Nieuwdorp M, Dallinga-Thie GM, et al. Pathophysiology of hypertriglyceridemia. Biochim Biophys Acta 2012;1821:826-32. Richardson K, Nettleton JA, Rotllan N, Tanaka T, Smith CE, Lai CQ, et al. Gain-of-function lipoprotein lipase variant rs13702 modulates lipid traits through disruption of a microRNA-410 seed site. Am J Hum Genet 2013;92:5-14. Kim JK, Fillmore JJ, Chen Y, Yu C, Moore IK, Pypaert M, et al. Tissue-specific overexpression of lipoprotein lipase causes tissue-specific insulin resistance. Proc Natl Acad Sci U S A 2001;98:7522-7. Walton RG, Zhu B, Unal R, Spencer M, Sunkara M, Morris AJ, et al. Increasing adipocyte lipoprotein lipase improves glucose metabolism in high fat diet-induced obesity. J Biol Chem 2015;290:11547-56. Kalmár T, Seres I, Balogh Z, Káplár M, Winkler G, Paragh G, et al. Correlation between the activities of lipoprotein lipase and paraoxonase in type 2 diabetes mellitus. Diabetes Metab 2005;31:574-80. Cho YS, Go MJ, Han HR, Cha SH, Kim HT, Min H, et al. Association of lipoprotein lipase (LPL) single nucleotide polymorphisms with type 2 diabetes mellitus. Exp Mol Med 2008;40:523-32. Randle PJ, Garland PB, Hales CN, Newsholme EA. The glucose fatty-acid cycle. Its role in insulin sensitivity and the metabolic disturbances of diabetes mellitus. Lancet 1963;1:785-9. Boden G, Lebed B, Schatz M, Homko C, Lemieux S. Effects of acute changes of plasma free fatty acids on intramyocellular fat content and insulin resistance in healthy subjects. Diabetes 2001;50:1612-7. Furukawa S, Fujita T, Shimabukuro M, Iwaki M, Yamada Y, Nakajima Y, et al. Increased oxidative stress in obesity and its impact on metabolic syndrome. J Clin Invest 2004;114:1752-61. Guo W, Wong S, Xie W, Lei T, Luo Z. Palmitate modulates intracellular signaling, induces endoplasmic reticulum stress, and causes apoptosis in mouse 3T3-L1 and rat primary preadipocytes. Am J Physiol Endocrinol Metab 2007;293:E576-86. Wei Y, Wang D, Topczewski F, Pagliassotti MJ. Saturated fatty acids induce endoplasmic reticulum stress and apoptosis independently of ceramide in liver cells. Am J Physiol Endocrinol Metab 2006;291:E275-81. Karaskov E, Scott C, Zhang L, Teodoro T, Ravazzola M, Volchuk A, et al. Chronic palmitate but not oleate exposure induces endoplasmic reticulum stress, which may contribute to INS-1 pancreatic beta-cell apoptosis. Endocrinology 2006;147:3398-407. Kharroubi I, Ladrière L, Cardozo AK, Dogusan Z, Cnop M, Eizirik DL, et al. Free fatty acids and cytokines induce pancreatic beta-cell apoptosis by different mechanisms: Role of nuclear factor-kappaB and endoplasmic reticulum stress. Endocrinology 2004;145:5087-96.